BEE BEE Clown has moved to the Greater Big Rapids area of Michigan. She is happy to service schools, parties, offices, and festivals around the Western Michigan, northern Michigan area as well as the Northern suburbs of Detroit and Ann Arbor. Please contact her for more information on how to make your event not only spectacular, but completely memorable. Bring in some fresh energy to the office for an impromptu dance party to help with innovation in the office! Bring in a new show like the all LED Glow Show new for 2017 for your event! Surprise a friend with a super fun singing telegram! Let BEE BEE Clown bring some energetic fun to your party! Medical News Today writes about some of the science behind our bodies and laughter. Tim Newman, who is fascinated by all things neural sites a study from the journal Cerebral Cortex. Participants were tickled and either allowed to laugh, or not allowed to laugh as an MRI took images of the brain. Newman's Article sites Bertrand Russell's quote about how laughter is one of the best medicine options for healing. Laughter helps keep people positive, which then affects psychology which then also affects our physiology. He even sites laughter yoga as a way to immediately increase mood, and decrease long-term anxiety. In another article, laughter has serious medicinal benefits, so much so that laughter is prescribed by doctors. It might even be able to prevent cancer. Check out more on the science of laughter check it out on my blog. Please stay tuned as I explore more about the healing power of laughter and how some giggles can actually improve your life! Need to have a giggle? The best place to find a good giggle is with BEE BEE Clown! She has a long history of making kids and adults laugh. Not only with laughter yoga but with her shows too. Are you having a party and need some entertainment in the Washington DC, Maryland or Virginia, Call BEE BEE Clown and have a great party experience. If you are in an office and just need a change, hire her for an Impromptu Dance Party, or a Singing Telegram. Disrupt your day with some fun! Want an innovative new idea? Have a glow party! Juggling with LED (light) objects and coming soon a digital programmable object that will be the talk of the town. Spring is finally here, take the opportunity to book now, because time is of the essence. BEE BEE Clown has a new offering this spring, a LIGHT show! Called the glow show, this offering is modern, and brand new and ripe for your Glow Party! With a Cirque du Soleil feel, and quality, this show is sure to wow the crowd. She is still offering the awesome and highly rated juggling and hula hoop show for all ages. Balloon twisting can also be included. Are you hiring a clown for the first time? Call BEE BEE Clown and let her guide you through the process. She will help you figure out timing and the best way to keep both the kids and adults entertained. If you want another costume option, she will work with you on that too. BEE BEE Clown is nationally available and locally hirable. Throughout the DMV, DC, Maryland, and Virginia, without extra fees. If you would like to have BEE BEE Clown in your state, please consider travel expenses, she would love to travel to you. 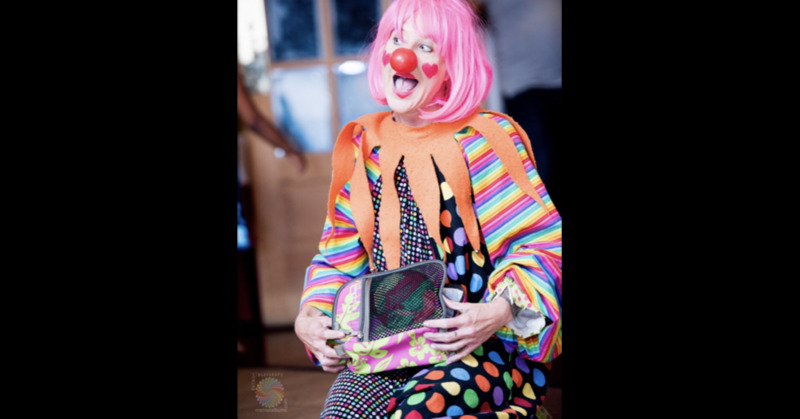 Bring on the FUN and bring on BEE BEE Clown to entertain at your party. By the way Katy BEE teaches circus arts too in case you or your kids or your school might be interested. Katy BEE LLC Launches New Website! Katy BEE LLC is the parent company behind BEE BEE Clown. Katy BEE offers singing telegrams, dance telegrams, impromptu dance parties, original characters for events, LED hula hoop and poi, mime, choreographed entertainment, improvisation, and there is still more coming. For 2017, the company offering the best clown in the DMV, has launched a brand new website. Disruptive Innovation - Invite an Impromptu Dance Party! When days at the office seem to run together, and the winter blues are getting you down, call us! We offer ways to create disruptive innovation through impromptu dance parties. We can show up in costume, or business casual, your choice. We bring the speaker and the music, and help you get a short party started. The health benefits of dance are documented and even folks that may not like exercise would love to simply rock to the music for a few minutes. Disrupt the office and create a little more innovation by bringing the Impromptu Dance Party to the office. It will benefit your business in more ways than you think. Snow getting you down? Hire a VIDEO VISIT! Need an option while the winter hits, that is something different to help your special ones feel even more special? Hire a video visit from BEE BEE Clown or any of our other characters. Can be live or pre-recorded, personalized and directed specifically at your recipient. It could be a singing telegram, a dance telegram, a show from BEE BEE Clown with juggling, or just a silly dance party with a playlist that you pick! We will sing and dance along with you! Prices start at $100 for video. There are many options to help customize the experience and we will work with flowers or other delivery options (for additional charge) to help get something amazing delivered to your birthday or celebration recipient. Call us! Email us! let's make something special together! BEE BEE Clown or Katy BEE can come to you on VIDEO and create a special moment for your loved one! Halloween is over what kind of costumed character would you hire? There are a large number of costumed characters in our vault! Would you like a mime show with juggling and hula hooping? Would you like to have a pirate at your special occasion? Costumes are not just for Halloween! They are for special occasions and to help liven up your event! Bring on the fun with Katy BEE, or BEE BEE Clown, and you will have the best party experience around! Creepy clowns can't take away from the joy of clown entertainment! Here is a link to NBC4's interview with BEE BEE Clown!